Metal! 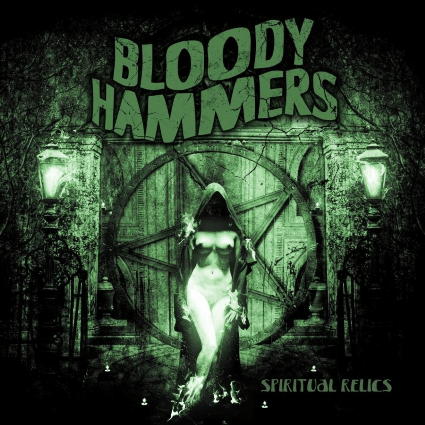 : Bloody Hammers, "Spiritual Relics"
Bloody Hammers lead the charge to Halloween with their new evil disc, Spiritual Relics. On the 25th day of the 12th month of 2012, the Six-Tongued Hellgoat was summoned to rise from the ashes and bring darkness to this place called POPdose. Join him in his quest. Bloody Hammers is one of those bands that if you see them in person, you simply can’t get them out of your head. Lead singer / bassist, Anders Manga is like 9,000 feet tall and an intimidating looking dude and organist Devallia is a dark goddess that could probably cast a wicked spell on you and stricken you to listen to nothing but Justin Beiber all day long. Their self-titled disc last year got a ton of praise, including right here on Popdose and Spiritual Relics is even better. Bloody Hammers base their music in low-end heavy doom metal, immediately reminiscent of the classic Sabbath vibe. Some more modern riffs help bring the sound into this decade though. In turn, their music should appeal to a wide variety of rock and metal fans. The Hellgoat absolutely loves “Witch of Endor” off their debut record and while there isn’t one individual track that’s better than that tune, Spiritual Relics overall is a much more consistent effort from the group. There’s not a weak track on the album, led by the raucous opener, “What’s Haunting You” and punctuated by the dark, “The Source.” What Bloody Hammers does well is craft a musical atmosphere of evil and doom to go along with their occult themes which is felt throughout the entire disc. To give you an idea of where they fit in to the metal landscape, Phil Anselmo asked them to play his Housecore Horror Film Festival alongside Down, Eyehategod, Goblin and Pig Destroyer. That actually seems like the perfect fit for this band as they seem destined to score a Rob Zombie movie in the future. The Hellgoat can absolutely see these guys right along bands like the aforementioned Down or High on Fire. But they’d also make a hell of a pairing with Ghost as well. And as the Hellgoat listened to the record more and more, some of the mellower moments kept reminding him of the gloominess that Marilyn Manson has shown on his last few albums. The Film Festival seems like the time for Bloody Hammers to shine and breakthrough on a bigger scale. They’ve progressed from pieces of good material, to an album of consistently good tunes. Album three is going to be the highly anticipated one, mark the Hellgoat’s word on that one. In the meantime, Spiritual Relics is a hell of a place to start familiarizing yourself with this pretty awesome band.